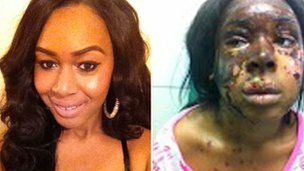 Naomi Oni, 21, had acid thrown in her face after getting off a bus in Lodge Avenue, Dagenham, on 30 December at at 00:40 GMT. On Friday, a 21-year-old woman was arrested on suspicion of being involved in causing grievous bodily harm. On Sunday, a man aged 28 was taken in for questioning on the same offence, detectives said. NB: Yesterday articles appeared questioning whether this may have been a case of “self-harm“.